Live simply with gratitude, peace, joy, and compassion. The following daily practices are suggested for all Salt Lake Buddhist Fellowship Group’s friends and interested parties. We highly encourage you to diligently practice them on a daily basis so that your life can manifest its potential for peace, gratitude, harmony and compassion. The Buddha said that the mind is a creator; it paints your reality like a artist paints a portrait. Your mind’s portrait is the life you are leading right at this moment. Through the practice of daily observances, you can transform your inner reality and “paint” a new life, full of liberation, peace and joy, thereby positively transforming your life and the world you live in. The first two suggestions come from the Bright Dawn Way Of Oneness Sangha and Reverend Gyomay Kubose. The term “altar” may not be appropriate for our purposes. The word has different associations for different people. If the word “altar” is troublesome, the phrase “Special Place of Tranquility” (SPOT) can be substituted. It should be noted that the word “tranquility” does not refer to just a quiet serenity, but involves a notion of “quiet power” or “dynamic serenity.” In any case, your altar or SPOT is not a place where something is worshipped or prayed to in the usual sense of those words. Your SPOT does not need to have a fixed “religious” central point of focus. If such a symbol is desired, traditional Buddhist icons can be used and/or items with personal meaning can be included. The intention here is to provide a universal motif that can be individually customized. Your SPOT can be a secular (ordinary) place that is made sacred (spiritual) through your attitude. Conversely, your SPOT can be a sacred or religious place that is intimately related to your secular or everyday life. In other words, your SPOT need not be labeled as a solely sacred or secular place. Our approach is the Way of Oneness. In the present context, this means that such dualistic terminology as sacred versus secular can be transcended. If you already have a Buddhist altar, fine– by all means, use it. Our basic SPOT items include bell, candle, flowers, incense burner, and ojuzu (meditation beads). The incense burner is usually put in a middle position, with the candle on the right side (as you face the incense burner) and the flowers on the left side. The bell can be put at any convenient place. 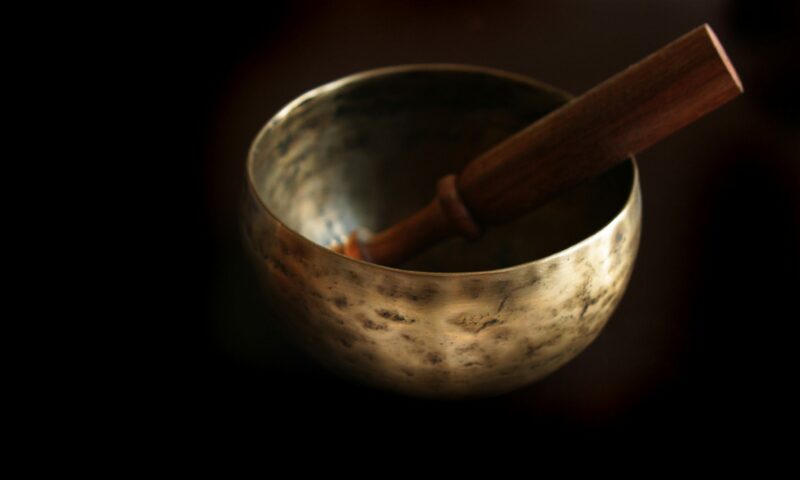 Traditional usage involves lighting a candle and incense, ringing a bell, doing Gassho, and optionally, chanting a sutra and/or doing a reading. Minimal usage would be simply to ring the bell and to put one’s hands together in Gassho. This procedure is fine and is in no way inferior to more involved rituals. In fact, it may be advisable to routinely use only the minimal procedure– and to add other aspects only when your mood or need motivates you. You should not consider there to be an absolute right way of doing things. Thus, incense need not be lit routinely if you are sensitive to the fragrance or allergic to the smoke. Flowers are beautiful but often may not be easily obtainable. However, it is nice to have a flower vase, incense, and burner on hand so that when you do want a more extended or formal service, everything will be ready for use. Flexibility is the key when setting up and using your SPOT. Any suggested traditional guideline is simply a convenience, in the sense of having a standard to work from. The most essential thing is your respectful attitude. As part of our 21-Day Program, a Harmony Gassho and Gratitude Gassho is done daily at one’s SPOT. (See the Everyday Gassho sheet for information on how to do Gassho.) The SPOT can also be used for home religious services (see sheet on Home Religious Services). The act of Gassho is done by putting the palms of one’s hands together in front of the heart and bowing the head. Gassho may be done sitting or standing; with eyes closed or open; and with or without ojuzu beads. Keep a monthly calendar handy and immediately after doing your morning Harmony Gassho put a diagonal slash mark from right to left through that day’s date. The Gratitude Gassho is done in the evening and recaps your day. It is suggested that you do it just before eating dinner– again mentally making eating contingent upon first doing Gassho. On days you eat out, you can do your Gratitude Gassho just before going to bed. Perhaps a “Gassho” reminder sign near your bed would be helpful. Immediately after doing your Gratitude Gassho, put a diagonal slash mark from left to right through that day’s date on your monthly calendar. The verbal recitation accompanying your morning Gassho can be the word “harmony.” In lieu of any other strong considerations, it is suggested you use the recitation “harmony” during your initial 21-Day Program. Other recitations can be introduced later. Your recitation can be spoken with any degree of loudness or simply be said to yourself. The depth or power of the recitation is facilitated through your breath. After a moderately deep (but not overly long) inhalation through your nose, make your recitation as you exhale through your mouth. The sound of the last syllable should be extended until the end of the exhalation. As an approximate guideline, your inhalation can be about 3-5 seconds long, whereas your exhalation should be about 9-15 seconds long. Keep your body and head erect as you inhale. As the last syllable of the recitation is being extended, slowly bow your head, keeping your hands and body still. At the end of the recitation, most people like to stay in the finishing position for a while (perhaps for 1-3 normal breaths) so that one doesn’t get the feeling of rushing off immediately after the recitation. The preceding is a description of a standard or basic procedure; other variations can be developed later after the initial 21-day period. Other than doing the one recitation, there is no recommended number of additional recitations you should do. More is not necessarily better but if desired, you can do more than one (although it probably is not a good idea to do more than three at a given time). The underlying sentiment of the Harmony Gassho is that you will try your best to have a spirit of cooperation with others, and always be as calm and patient as possible. The seed of this sentiment will gradually blossom into an understanding that can be called wisdom. The underlying sentiment accompanying the Gratitude Gassho is an awareness of interdependency– that one is supported by nature, by other people, by everything. There is a feeling of “counting one’s blessings,” of “grace,” or of “how grateful I am.” The seed of this sentiment will naturally blossom and be expressed in compassionate ways. Putting your hands together in Gassho can be broadened to include different creative hand gestures that can be related to a variety of themes or everyday activities. Examples of suggested Gassho’s to add to one’s “Spiritual Tool Bag” are a regular feature in our newsletter Oneness. See “YES” (Your Everyday Spirituality) on the newsletter’s back cover. Individuals are encouraged to discover/create their own Gassho’s. You may feel, “I know about Gassho; what’s the big deal about doing Gassho?” You may even think that Gassho is something simplistic and perhaps narrow in scope and effect. However, the Harmony and Gratitude Gassho as previously described are only a beginning. They are two handy “tools” for your “spiritual tool bag.” There are many more “tools” or different kinds of Gassho that can be added to your spiritual tool bag. Your spiritual path will become deeper and richer. Many people need to be liberated from the idea of spiritual practice as only being practices authorized and approved by some authority. There is definitely a place for the time-tested traditional rituals handed down through a particular lineage. These rituals need not be rejected. It is not a matter of advocating that something is taken away but rather of adding something. Modern spirituality requires the flexibility of attitude in order to internalize and make the ancient truths relevant to an individual. Spirituality is individual and personal. Individual creativity in spiritual practice does not have to be viewed as an egotistic act that threatens established ways of doing things. Creative expression and application of the established ways should be encouraged. Growth means being open to change, both for individuals and institutions. If a particular traditional way works for someone and nothing else is desired, this is fine too. It is not necessarily an either-or situation when considering an individual’s spiritual path. Do what works for oneself and don’t judge others who are doing things in other ways. Being non-judgmental is of great value in living one’s life with inner peace and in harmony with others. Diversity in spiritual paths is okay. One may start out in a narrow, sectarian tradition– and by following this path in depth, one’s spirituality may mature and come to be expressed in very open liberal ways. Conversely, one may start out exploring many different individualized spiritual paths– and as a result, come to settle in one particular way as the best for oneself. All paths have value because what is of value depends on time, place, and person. The word value is being used here not with regard to religious truth or teachings themselves but rather in how a person accesses, applies or expresses such truth or teachings. Just be sincere, and don’t forget to laugh. Here is a more formal daily practice for some who are looking for something a little more traditional. Copy and print the following Daily Observance for your personal use. Please read the suggested steps and modify them if needed. a. Palms in gassho (in reverence) with malas (meditation beads) wrapped around hands. Sit on chair or cushion. b. Ring bell (three times and then bow) while you do this follow your breath mindfully. “I am of the nature to grow old. The consequences of my actions. And the fellowship of Sangha. faith, and compassion, and awaken to the boundless Pure Land here and now. IV. Zen meditation if time permits. Practice meditation to help generate inner silence so you can deeply hear the call of Boundless Life and Light as the Nembutsu-Namu-Amida-Butsu. Sit on a zafu (meditation pillow) or chair for 10-20 minutes. As a practical suggestion, visualize the sacred light of Amida, full of warmth, love, and compassion, before you and allow yourself to entrust and then totally surrender to this living Light. Then, let the Light penetrate you until you can visualize yourself becoming totally penetrated and embraced by the sacred Light. Then, from deep within your self, hear the sacred voice calling unto you. Then, chant the nembutsu, as the living revelation of your infinite nature. Voice the following shorten version 10x, 30x or even 108x. Throughout the day, practice deep hearing; become aware of and entrust in Great Compassion, symbolized as Amida Buddha, which surrounds and sustains you and all beings. Let the feeling of gratitude and compassion arise from within you and recite the Buddha Name, Namo Amida Buddha. During breakfast, lunch, snack time and dinner, practitioners should recite either vocally or in the mind the Prayer of Mealtime Thanksgiving. May I be worthy to receive it. To transform my unwholesome qualities into wholesome ones. for the sake of all beings. I saw a story about your Sangha on the news. I was deeply moved by the act of kindness that your Sangha performed when they replaced the statue of The Buddha that had been vandalized. I have been looking for an English speaking Sangha with the diversity of your membership. I have been studying, and trying to practice Buddhism for several years now . I would like to formalize my commitment to Buddhism with your community. Thank you for reaching out – we were able to help as were others in the neighborhood and Ben’s Zen group also helped. We would love to have you come visit. You are welcome any time – We have a meditation group this Wednesay at 630 pm and our Sunday gathering is at 10 am. We are located at 3474 S 2300 E Suite 12 in MIllcreek. my number is 801-502-8130 if you have any questions.